Intermedia’s First Call Resolution – What happens when something happens? You may hear us tout our “Worry-Free” service and support. As a customer-centric organization, we’re deeply committed to helping ensure your cloud performs at the highest level. As our business has grown in recent years, we’ve faced the challenge of responding to technical support requests from our expanding customer base. Early last year, as part of our effort to continuously improve our customer support, we reviewed customer feedback specific to the technical support team. We discovered that when calling support, some of our customers had felt they were being rushed or passed around to too many people to resolve the issue. We knew we needed to take immediate action to ensure a Worry-Free ExperienceTM for our customers. Thus was born Intermedia’s First Call Resolution initiative. We started by sharing the customer feedback with the team. Then we created a game plan to help decrease response times while restoring customer confidence. The goal: resolve support cases during the initial call as often as possible. Improving the way that we use case statuses (For example, it became standard procedure for the agent to ask the caller for permission to close their case and then close it instead of marking the issue as “resolved” and then having the system automatically close the case three days later). We also created a new team dedicated to answering complex technical questions from our Level 1 support agents. 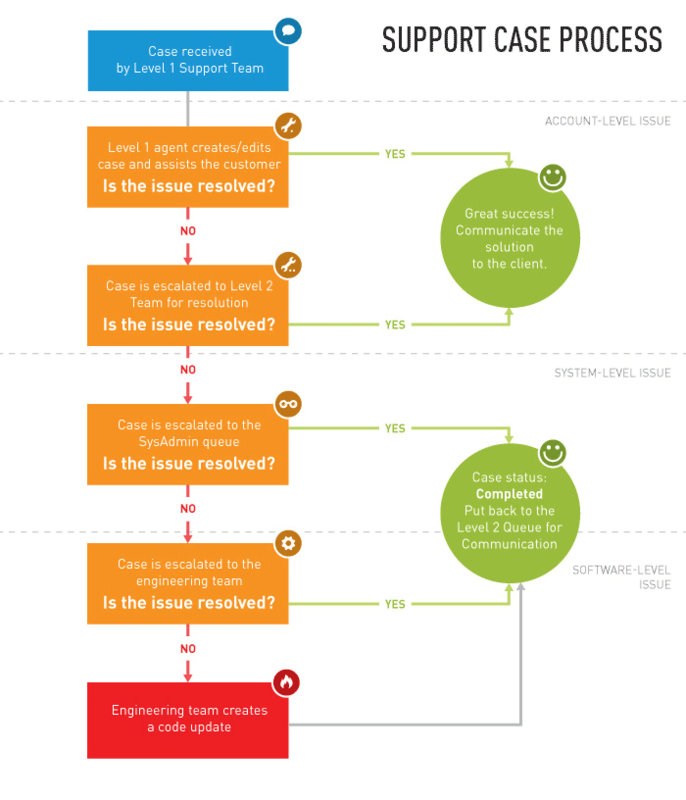 This enables the Level 1 team to resolve minor issues more efficiently, without having to escalate the case to another support agent. We also maintained the Level 2 escalation team for issues that require the Level 2 support team to work with the customer. Service that’s measured around quality resolutions. We don’t pressure our team members on call length. Our key service metrics are related to resolving your case on the first call and your satisfaction. An obsession with your satisfaction. We’ll survey your satisfaction after every call. And we’ll contact you every six months to ask how we can better meet your needs. When we first set out to implement this new initiative, we set a goal for ourselves to reach 85% first call resolution. We’re happy to report that we’ve since exceeded that number! We work daily to maintain this metric because we believe that first call resolution is the best way to handle our customers’ technical issues. We hope that you never have trouble with your Intermedia service. However, if an issue does come up, give our support team a call at 1.800.379.7729 and we’ll work with you to quickly resolve it.